Dusty Roads is a high-energy Georgia-grown Americana band, formed by Atlanta based musician, John Mickelson. When you’re at a Dusty Roads show, expect to hear influences of the legends of country and bluegrass music, such as Merle Haggard, Flatt & Scruggs, Willie Nelson, Buck Owens, and Bill Monroe. You can also expect sprinklings of songs and sounds of the great writers and musicians from across the globe and halls of time, like Django Reinhardt, Duke Ellington, and Irving Berlin. “Come take a trip, down that long, dusty road”. Comprised of some of the Southeast regions finest pickers and singers, the band is ever evolving and growing. “We’re all Georgia boys” says Mickelson of the band members, which features Jared Lanham on mandolin and tabla – the traditional Indian hand-drum. “Colt Bowen has one of the lightest touches of any drummer in town” says Mickelson of the Dusty Roads drummer. 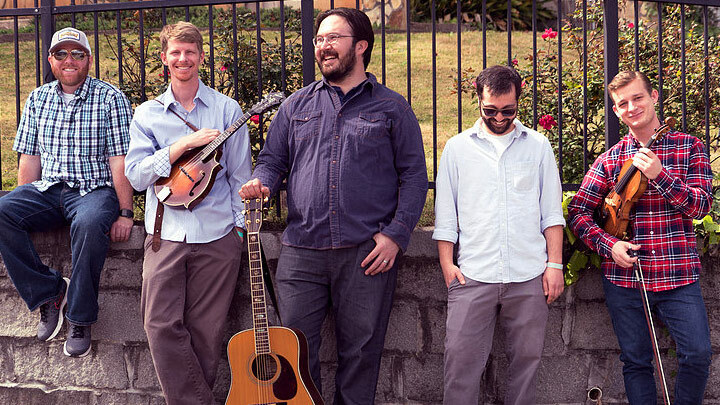 Fiddlin’ phenom Danny Bermel joined the group in late 2016, and adds an agile musical flare that pushes their musical crescendos to another level of fever-pitch. Dusty Roads is constantly searching for that sound, that lick, that twangy hook that sinks deep into the listener’s soul and pulls them into the unfolding story of each song. The group cherishes the purity of silvery strings ringing together harmoniously. The band champions comradery, respect for the craft of their instruments, and finely constructed songs that feel as if they soar down from the mountaintop to resonate the listener’s heart-strings. “We came here with one purpose, to have a blast playing and performing live acoustic music”– says Mickelson, singer/songwriter for Dusty Roads. Growing up in Atlanta, he was surrounded by a diverse world of cultures and music his whole life. “My great-grandfather was a mandolin player from Germany, so I guess it just runs in the blood”, says Mickelson of his musical lineage. Like a rear-view mirror in a pick-up truck, Dusty Roads looks back through the history of written and recorded music, studying fervently to decipher just what made each of these classic songs so special and unique. Just like ‘looking backwards to go forwards’, Mickelson applies this approach to writing original material for the band.